Occulus Rift rollercoaster ride. Photo by The Building Museum and Agnese Sanvito. There is a lot of technology on display in Drawn to the Future at The Building Centre. Thankfully, this exhibition about architectural, planning and engineering visualisation is much more than a geeky celebration of computer power, and does an excellent job of showing how tech enables design and planning practices, presenting technology as a tool in the service of human creativity. The worlds of gaming and spatial analysis converge to give planners, politicians and the public new tools for making sense of big data and master plans. So, for example, visitors can take a virtual reality roller coaster ride in an Occulus Rift headset. Elsewhere, Cities: Skylines is a new 'build your own city' game, and you can also see a Minecraft version of Britain built using Ordinance Survey data. 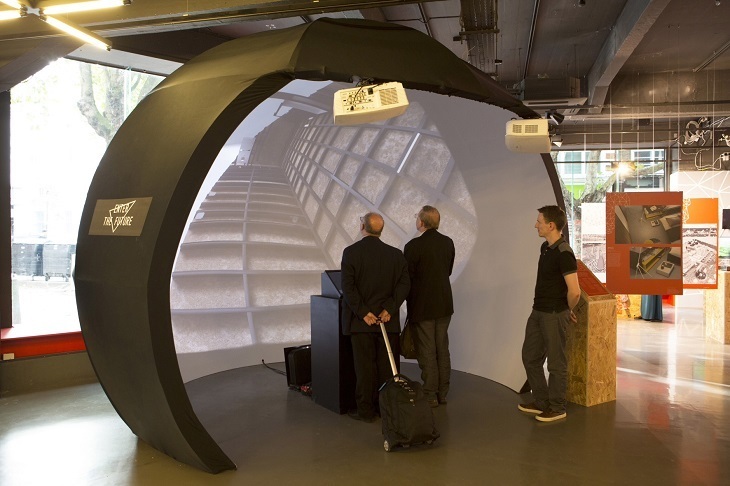 Immersive virtual reality dome by Soluis Interact. Photo by The Building Centre and Agnese Sanvito. 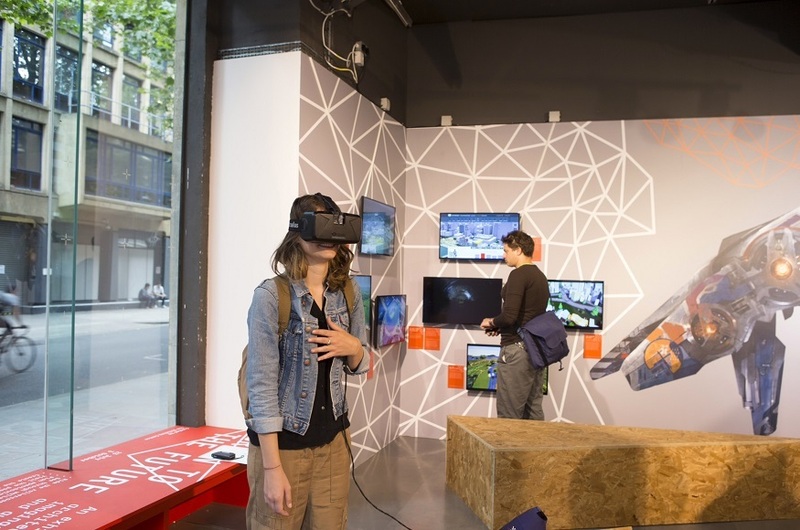 The games are displayed beside (practically identical) professional visualisation tools; the first public display of a 3D fly-through over the route for the proposed HS2, and an immersive virtual reality dome by Soluis Interact which shows the latest techniques used by architects to demonstrate their designs to clients — from hotel rooms to chapel restoration. We were impressed with John Cook's Cambedoo Solar Estate, a vast solar power array and settlement in the desert in 2065 that is dismantled over the following centuries. Cook's animation of the future city as it decays shows mastery of new technologies of drawing, underpinned by a deeper understanding of the challenges of sustainability and durability in architecture. 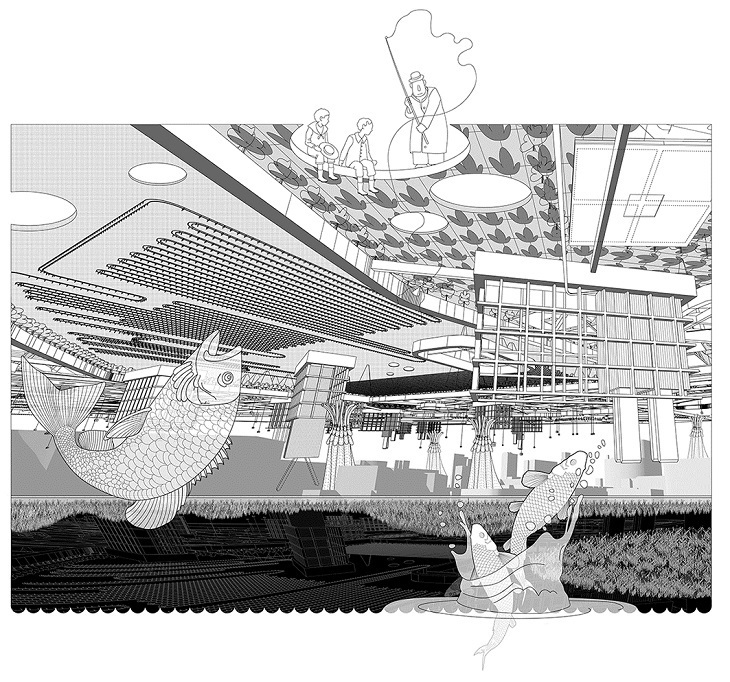 Drawings of future cities designed for food production by CJ Lim, and his student Jason Lamb's drawings of 'Frackpool' (Blackpool after fracking), show the power of computer assisted line drawings to evoke the future and provoke debate about the present. The Food Parliament. Picture by CJ Lim, Studio 8 Architects. Tucked behind a curtain in the corner is a 3D printed model of a Peruvian hillside, with landuse and sites of importance to marginalised residents projected from above. The project by researchers at University College London collected topographic data using drones, and used GPS to track the routes used by locals in their everyday lives moving over contested land. Collecting and visualising data like this provides new windows for democracy, as academics and communities collaborate to help resolve local disputes and plan for the future. The technologies on display in this exhibition provide new ways of visualising the future — although we must remember, visions of the future are always imaginary. Used intelligently, new technologies provide architects, engineers, planners and citizens with tools to share the new ideas shaping our cities. The success of Drawn to the Future lies in how it positions technology within wider processes of creativity, design and democracy. Drawn to the Future, until 3 October, Monday-Friday 9am-6pm, Saturday 10am-5pm, The Building Centre. Free, no booking required.